Boxing is a great martial arts for developing the ability to throw beautiful punching combinations with accuracy and power. Training in boxing will also improve your head movement and footwork. Sparring sessions are a great opportunity to test the techniques learned in class and to advance your skills. This article lists 5 sparring tips that will enhance your boxing skills as well as examples of its implementation in a sparring scenario. Being able to disguise your movements and trick your opponents into exposed positions are excellent skills to have in your toolbox. Exploit your understanding of feints to open up counter punchers and to take advantage of overly aggressive boxers. Drawing your opponent forward – Use feints and body fakes to force them out of position. Setting traps – Feint a pawing or weak jab. Take advantage of the opening created by your opponent as they try to parry it. Changing the rhythm – Learn the ability to lull your opponent with slow movements, then blitz forward aggressively to catch your opponent off guard. Distance – Create false distances with your head position. Muhammad Ali is famous for leaning and positioning his head over his lead foot. As his opponent reaches forward and try to hit him, Ali leans back toward his rear leg. He then takes advantage of his opponent’s opening and attacks immediately. Footwork is critical for generating power and getting within striking range to initiate your offense. Furthermore, footwork is also vital to escaping danger quickly and minimizing the chance of getting hit. Light-footed movements – Instead of being flat-footed, stay balanced on the balls of your feet. This allows you to pivot and move in and out of range easier. Boxing stance – Focus on keeping the correct boxing stance throughout your sparring session. Consistently adjust your angle and have a bladed stance where your rear leg is hidden behind the lead leg. Keeping this stance makes you a smaller target and be harder to hit. Angles for offense – Create angles that gives you a positional advantage where you can set up your offensive barrage. Continuing to shift and pivot after your initial blitz will allow you to advance your position for further attacks. Angles for defense – In addition to head movements and blocking punches with your arm, try moving out of punching range at different angles. Do not rely on backpedaling to get out of danger. Getting out of corners – It is important to use footwork and combine it with head movements to dart out of corners and escape safely. Center control – Use your footwork to control the center of the ring. When you get the chance, work on cutting off the ring and cornering your opponent. 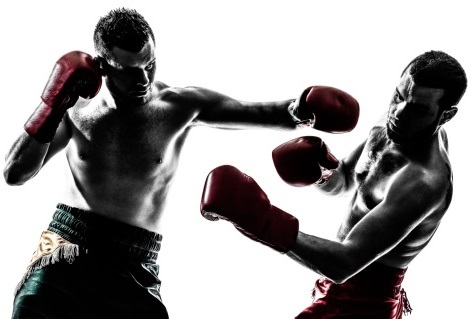 To be staunch defensively in boxing and minimize the numbers of hits to the head, it is imperative to combine head movements with the ability to blocking incoming punches with your arms and shoulders. Head positioning is also important offensively because you are exposing yourself every time you throw a punch. Centerline – Have the habit of getting your head off of the centerline as you punch. Offense – Being able to dodge punches allows you to stay in the pocket and immediately fire punches back instead of retreating and resetting your position again. Active head movements – You should be able to dodge not just the first punch thrown, but the ones that follow as well. To do so, it is important to combine your ability to slip and roll under punches. Slipping punches – Do not over-exaggerate your head slipping motion. Reducing the movement needed to move your head out of the punch’s way will allow you to recover faster. Infighting head position – During the moments of infighting, your head positioning is vital for controlling the opponent’s balance and head position. It is common for a boxer to lower their head and drive it below their opponent’s jaw. This action makes it uncomfortable for your opponent, points their chin towards the ceiling and limits their vision. With head positioning dominance, you should swarm them with uppercuts and hooks. Having the ability to throw various punching combinations is needed when you spar against experienced boxers. This makes it harder to correctly predict and take advantage of your openings. Avoid single punches – Throwing singles punches will make you become predictable. A great way to work on your combos is to do a live drill with your partner where you take turns throwing combos on the inside while the other person defends. Feints – Utilize feints as a setup before releasing your combinations. Doubling punches on the same side – Everybody’s natural defensive reaction is to expect a left punch to be followed by a right punch or vice versa. Doubling up on the same side would surprise your opponent and increase the chance of catching them uncovered. Body to Head – Throw combinations that hits the opponent’s body, which lowers their guard, and then follow up with a shot to their head. Mastering the use of your lead hand as a versatile arsenal will dramatically increase your success in the ring. Furthermore, consistent usage of the jab is a huge payoff since it is the starting point for many combinations. Measure – Use your jab to gauge the opponent’s distance and to set up the rear hand. Blinding jab – Block your opponent’s vision with a jab and divert their attention from the incoming rear hand. The jab does not need to be powerful for it to be effective. Disrupt opponent – Having the capability to time and land a powerful jab is fantastic for impeding aggressive and reckless boxers. Jabs to the body – Consistently using jabs to the body will lower the opponent’s guard and create openings for head shots. This is great to use against highly defensive or taller opponents. Lead hand control – Throw a pawing jab to hold the opponent’s lead hand in place while your rear hand delivers a powerful shot. Range and space control – Throw jabs to create distance between you and your opponent as well as to regain your position, especially if your opponent is cutting off the ring and trying to corner you.